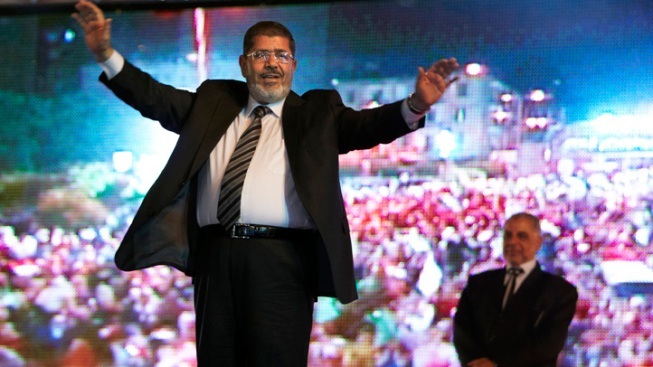 In this Sunday, May 20, 2012 file photo, the Muslim Brotherhood's presidential candidate Mohammed Morsi holds a rally in Cairo, Egypt. Sheik Rahman is serving a life sentence for his role in a plot to blow up the Holland and Lincoln Tunnels, the United Nations and other targets in the 1990s. He has also been linked to the first World Trade Center bombing that killed six and injured more than a thousand. Senator Frank Lautenberg (D-NJ) said the US will never free the Sheik. “Omar Abdel-Rahman is a terrorist with American blood on his hands and he will serve the rest of his life in detention," he said. “The Muslim Brotherhood, and Morsi now, are taking the position he be released on humanitarian extradition more so than overturning his conviction,” Moyeldin said. He said Muslim Brotherhood leaders are saying Morsi does not plan to repeat the comments in his address tomorrow and has condemned acts of terror against the West in the past. Sheik Rahman is in ailing health in a North Carolina prison. A Justice Department spokeswoman declined to comment, except to say the blind sheilk remains behind bars.